FERNANDO LUGO MENDEZ, President of Paraguay, said that to discuss the future of humanity it was necessary to correct past errors and rethink paradigms. Development could not be discussed unless the final aim was to achieve human dignity. One could not talk about technological advancement when millions of children were still starving to death. It appeared at times as though the world was resigned to poverty and inequality, and to a situation in which rich banks that ran the world’s economies and poor countries that provided the planet’s natural resources engaged in senseless dialogue, he said, pointing out that, although Paraguay’s economy had grown more than 15 per cent in 2010, the increase in tensions over inequality and wealth distribution was even greater. Solidarity was not only a moral imperative, but a prerequisite for progress and for combating violence and crime, he said. The world urgently needed a paradigm shift away from the development model of the past five decades, which had failed to improve the lot of millions of people, and towards a model that placed people centre-stage. Mutual trust and goodwill were needed to ensure that all men and women lived well, he stressed, adding that the sharing of wealth was the only way to avoid future conflict. The focus must be on achieving human dignity rather than the exploitation of resources, he emphasized, pointing out that poverty persisted in Latin America despite excellent conditions for the creation of wealth. It made no sense that the region’s countries remained poor when they had so many assets and other goods that enriched the rest of the world, including fresh water, food and renewable energy sources. Reaffirming his country’s steadfast commitment to multilateralism and a new democratic world order based on equality, he expressed support for strengthening the United Nations and making it more democratic. Paraguay also supported strengthening regional integration processes such as the Union of South American Nations (UNASUR). 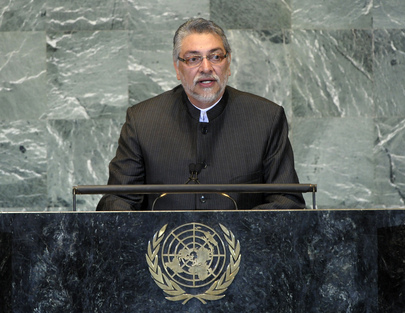 The Assembly’s theme of strengthening the role of mediation in conflict prevention and resolution was also very relevant, he said, expressing support for mediation, based on the principle of shared but differentiated responsibilities among developed and developing countries in overcoming global social injustices. Mediation should prevent the ruinous use of “preventive attacks”, which only destroyed lives and cities while spreading mistrust, he said, emphasizing that the self-determination of peoples must not be based on political and economic interests. Paraguay was an active participant in United Nations peacekeeping, he said, noting that the country had sent an engineering faction to the United Nations Stabilization Mission in Haiti (MINUSTAH). The Assembly must adopt the necessary reforms to make it a universal, democratic and respected body that could prevail over the Security Council, which required urgent reform and greater legitimacy. To achieve that, there must be greater representation of other Member States on the Council and a gradual elimination of veto power. Expressing concern over recent developments in Libya, he emphasized that the use of force must always be a last resort. He went on to say that his country opposed the 50-year-old United States economic blockade of Cuba and called for its immediate end, deploring its impact on the Cuban people. Paraguay did not recognize the extraterritorial application of international laws in violation of State sovereignty, he added. Recalling that Paraguay had established diplomatic relations with Palestine in March 2005, he said it recognized a free, independent State within the pre-1967 borders. The Assembly’s inclusion of Palestinian statehood on its agenda was the consecration of the international community’s historical debt to the Palestinian people to ensure their right to their own State, and it would contribute significantly to the Middle East peace process. As the current President of the Group of Landlocked Developing States, Paraguay called on transit countries and their neighbours to commit more strongly to implementing the Almaty Programme of Action, he said. Paraguay also reaffirmed its commitment to the Millennium Development Goals, and as part of its efforts to guarantee human rights, it had sought membership of the Human Rights Council for the 2014-2017 period. On climate change, Paraguay fully supported a second period of the Kyoto Protocol.